The Tabula Mundi Tarot remains true to the occult traditions of tarot structure while incorporating modern reinterpretations of the archetypes. 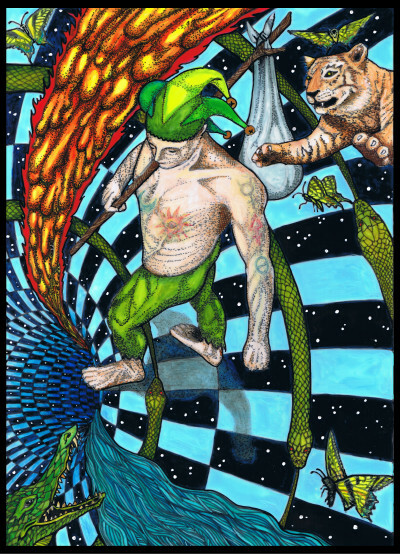 In this deck The Fool’s journey begins with a step into a wormhole in the fabric of space-time. Along the way the whole of creation is witnessed and a never-ending panorama of cognitive imagery is encountered: the Tabula Mundi or “picture of the world”. With tarot we hold a Universe in our hands. 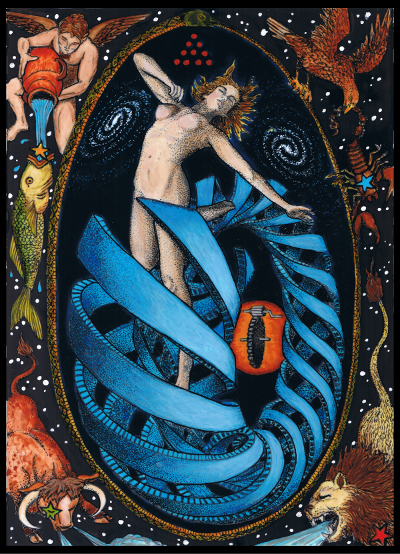 Tabula Mundi is a new tarot deck by M. M. Meleen, creator of the Rosetta Tarot. The artwork of Tabula Mundi is done on frosted mylar with fine point black permanent marker and colored india ink. The fourfold color scale developed by the adepts of the Golden Dawn using the framework of Alchemy, Astrology, and the Qabalah was referenced as each card was painted. This medium of ink on mylar although unforgiving of errors produces vibrant flashing colors to complement the evocative symbolism used in the images. A lot of the images start with an underlying sacred geometry grid and are built upon from there. Each original artwork is approximately 7×10″ and the originals took at least 25-30 hours to finish each, just the drawing and painting. This does not include consideration for research and gestation, scanning and adding borders, etc. Just the painting and drawing time. All art is done by hand, and none is graphically generated. It is just ink and paper. For updates on the work of M.M. Meleen, subscribe to the newsletter on the main page. Tabula Mundi is a Thoth based tarot deck, meaning it follows Thelemic philosophy and the number and naming structure of Aleister Crowley’s Thoth Tarot, which has a few key differences from decks with a Marseilles Tarot or a Rider-Waite Tarot based structure. All of the differences described here refer to this deck, and to the Thoth deck on which it is based. As in the Thoth tarot, the Major Arcana cards have some numbering and naming changes. “Adjustment” is in Rider-Waite-Smith based decks called “Justice”. Likewise “Lust” in this deck is called in the RWS deck “Strength”. Although the deck is Thoth based in structure, you will see that the artwork of every card is completely unique and in no way is the imagery influenced by the Thoth, yet it remains faithful to the esoteric meaning. 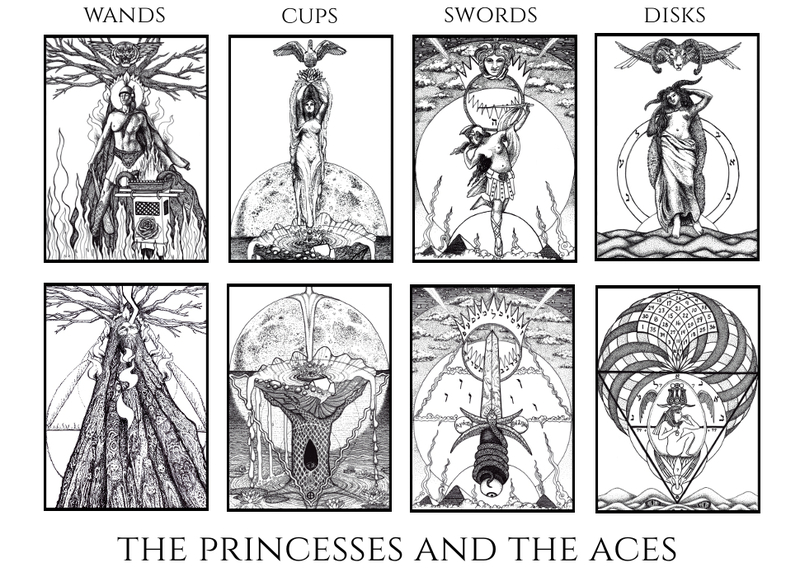 The deck is now a full 78 card tarot, as well as available in extra large Majors editions. The minors are completely unique reinventions of the archetypes, unlike many current decks that simply redraw the images of the Thoth or the Rider Waite, no matter how beautifully. This artist has spent many years studying the energies behind each card, and comes at it with the intent of both the occult student and the artist. The decanic Minors (Two thru Ten) of Tabula Mundi are constructed from their related Majors. 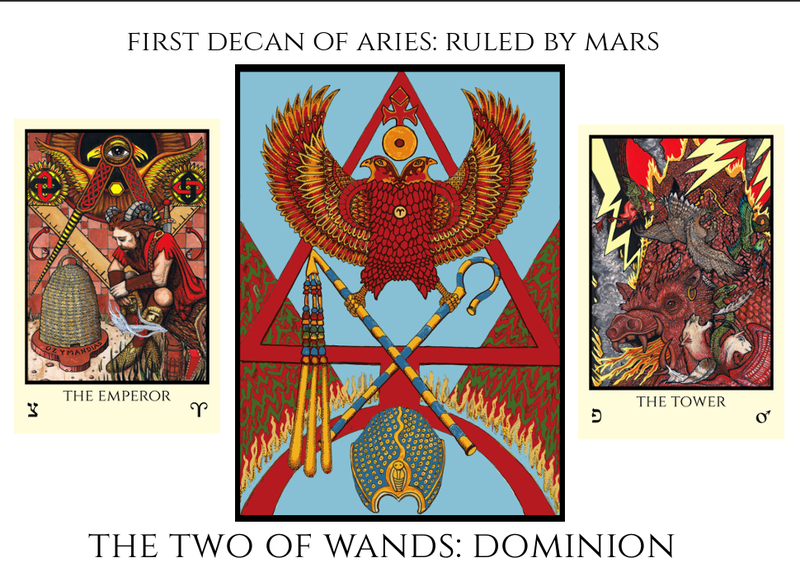 For example, the Two of Wands, Dominion, is the first decan (ten degree segment) of the sign of Aries (The Emperor). This decan is ruled by Mars (The Tower). Therefore, Dominion combines elements, and the color scales, from the Emperor and the Tower. To those colors it adds the color of Chokmah in Atziluth, pure soft blue. The card features the Khepresh, the Blue War Crown of Mars, the Hook and Flail, and the double headed Eagle/Hawk. This is a lovely deck. I would be interested in both the colour and black and white decks. Hello! Thank you for your wonderful projects! I am interested in purchasing the available decks, as well as the future coloured one. Are all of them limited edition, signed and numbered? thanks Bill! Making progress and almost there, getting closer all the time.